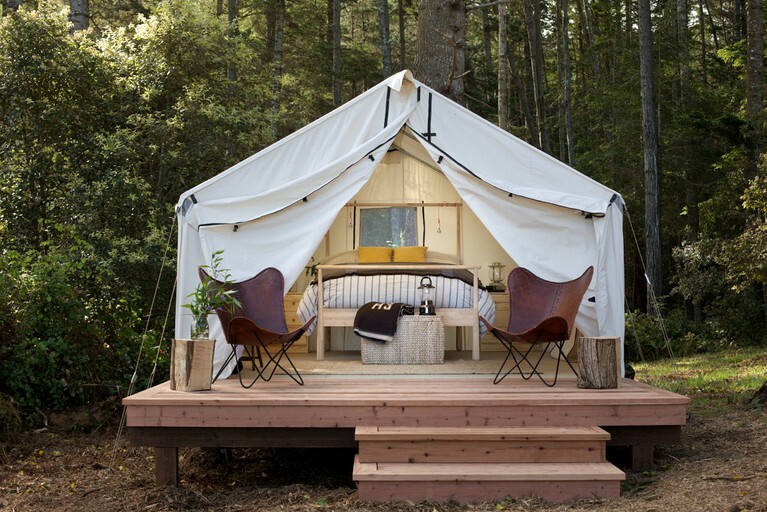 These roomy safari tents are 12-feet by 14-feet and housed on wooden platforms. 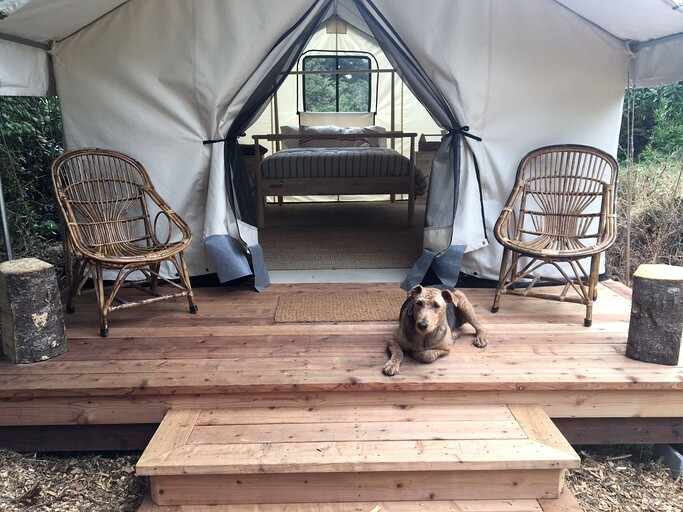 They come fully outfitted with a queen-size bed, down comforter, and cotton linens so when there is a chill in the air, glampers know they will be warm and cozy at night. 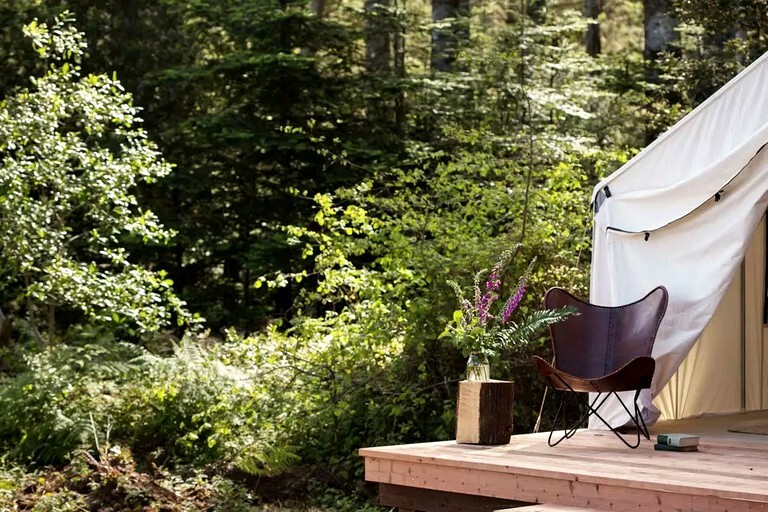 The tent has its own private deck complete with sling back chairs and a fire ring. 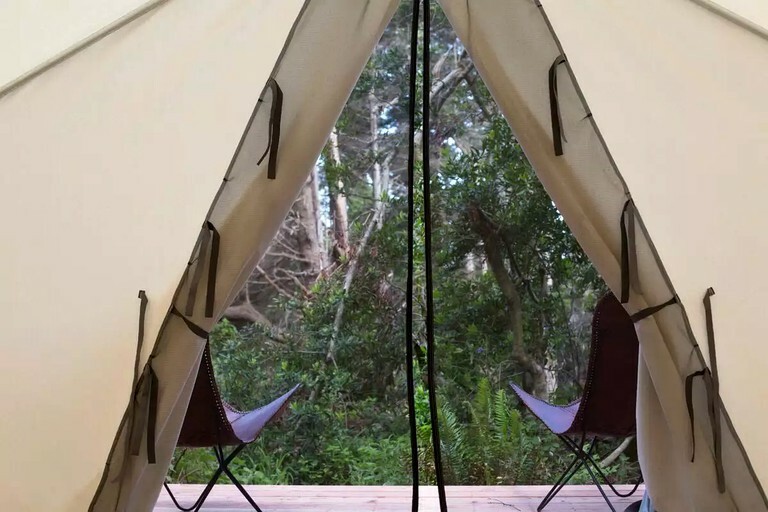 At night, share quality time with a glass of wine while gazing at the stars through the treetops and listening to the waves crashing to shore. 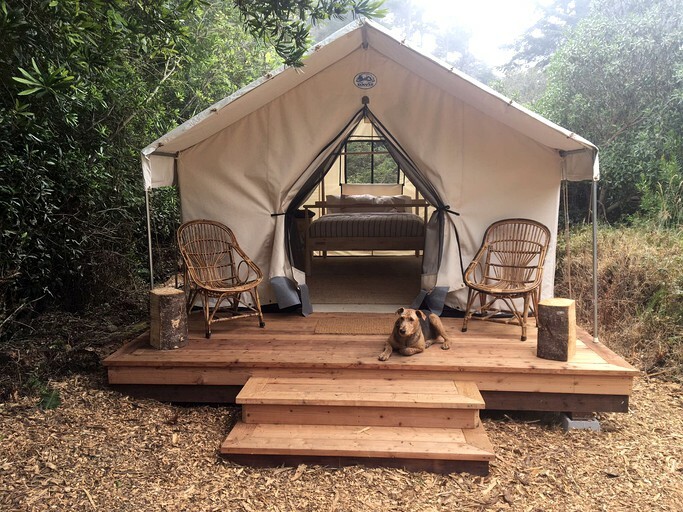 These safari tents are the perfect rentals for those looking to retreat into nature without compromising on luxury. 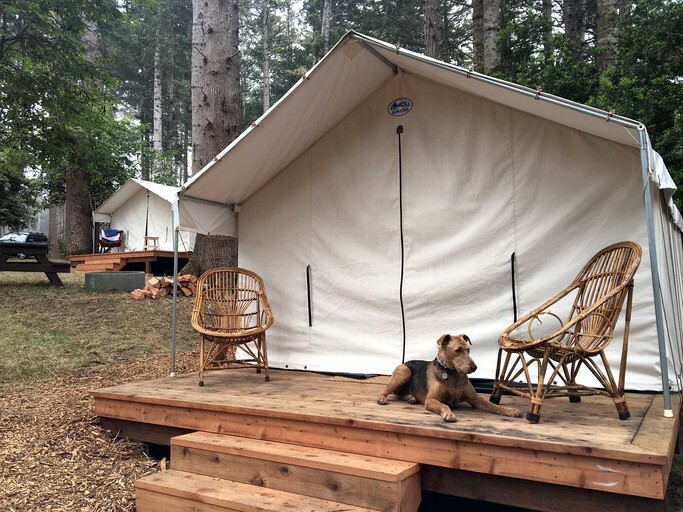 An additional $20 per night, per dog will be added to the reservation. Pets must be included in the reservation guest count prior to check-in in order to be assigned to a pet friendly accommodation. Guests with pets are asked to sign a liability waiver and pay a refundable deposit of $125 upon check-in. Guests will enjoy a beautifully renovated bathroom facility with towels and toiletry items like shampoo and body wash. Each site comes with a private deck. 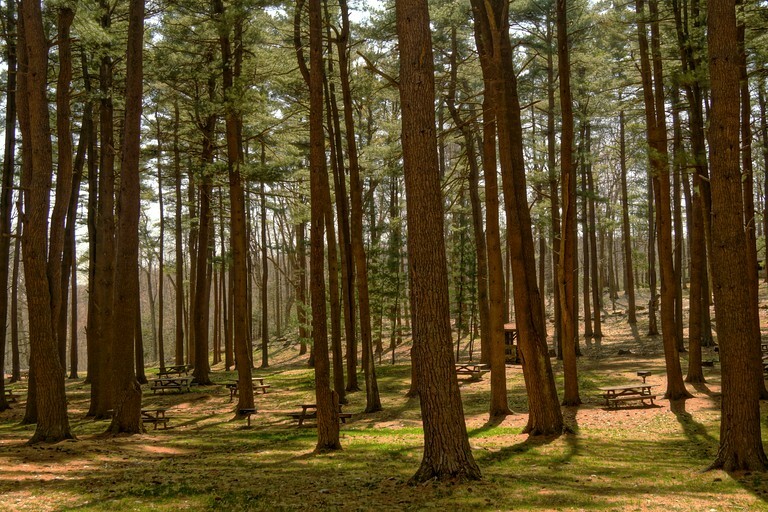 Communal BBQ areas are available in close proximity to the tents. Provisions can be purchased easily in town at Mendosa's Market & Deli -- a short, three-minute car ride. This property has free parking for guests traveling by car. Hosts provide a light breakfast each morning in front of the bathhouse from 8-10am. 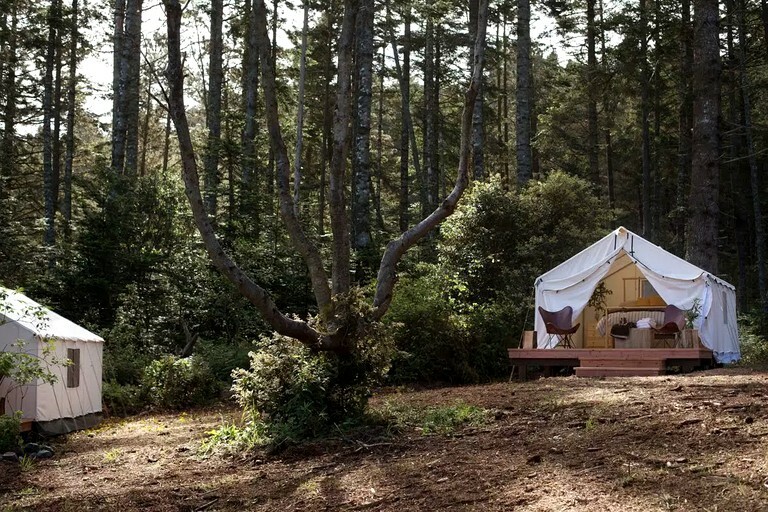 This property is located on a tree-covered bluff above one of most spectacular ocean fronts on the northern California coast. 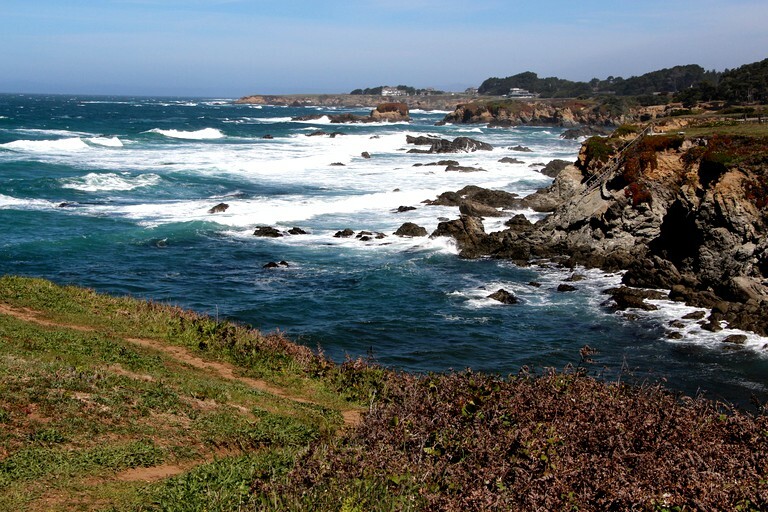 It is a short drive to the gorgeous beach at the mouth of Big River and the charming town of Mendocino. The town boasts an array of shops and restaurants including a fantastic bookstore, cooperative Health Food Store, Friday Farmers Market and first rate Gourmet Market/Deli. The site is an easy walk to "catch-a-canoe" boat rental on Big River. There, guests can rent outrigger canoes and mountain bikes. It's a long river that can be explored by either mode of transportation. 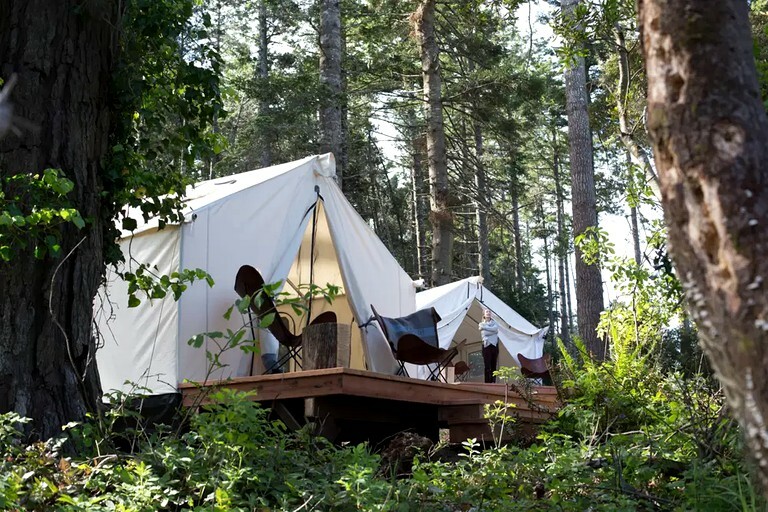 Glampers will also find a good selection of hiking trails in close proximity and shorter hikes on the property. Horseback back riding is available along the beach as is whale watching from the cliffs or by boat. Wine tasting in the region is one of the best in California. 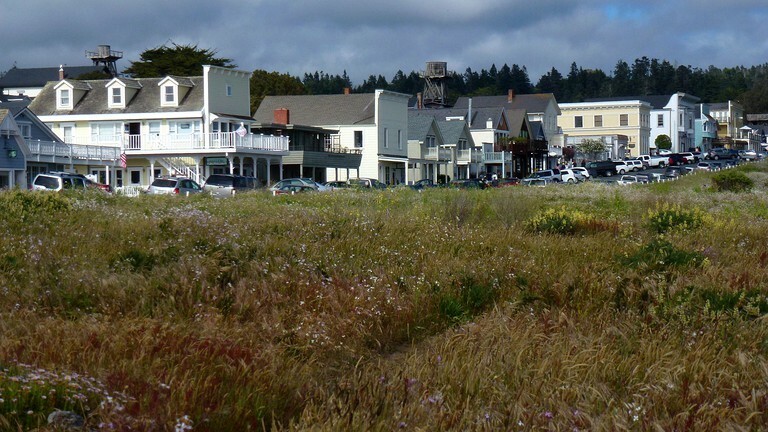 Finally, take advantage of the close proximity to the charming and historic village of Mendocino, where guests can enjoy shopping, dining, and incredible bluff walks. The Friday farmers' market is in full swing by June and is open from 12 p.m. to 2 p.m. The town has a fantastic bookstore, a cooperative health food store, and a gourmet market and deli. 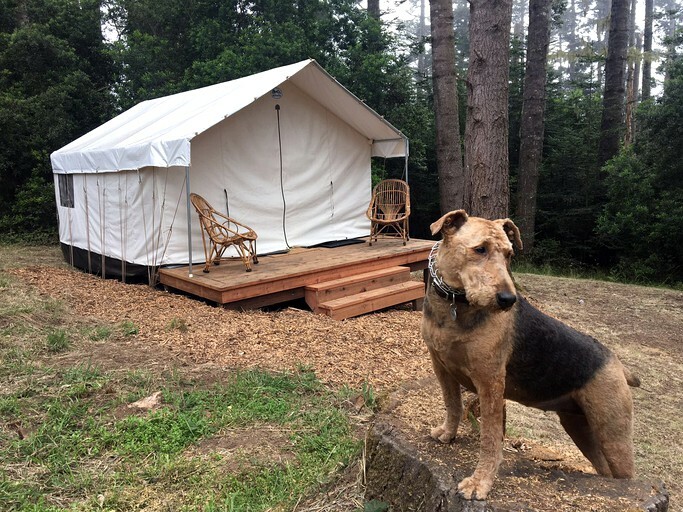 from 3 p.m. to 8 p.m.
An additional $20 per night, per dog will be added to your reservation. Pets must be included in the reservation guest count prior to check-in in order to be assigned to a pet friendly accommodation.